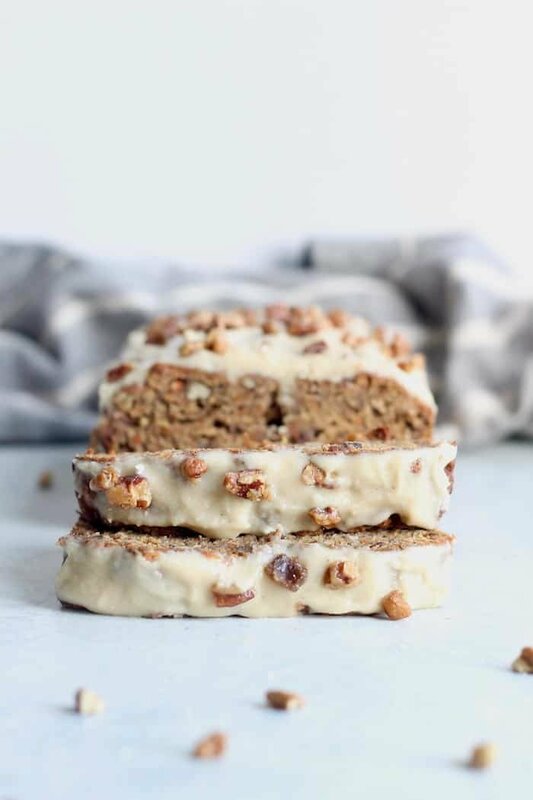 The most epically moist and delicious Healthy Chai-Spiced Carrot Banana Bread loaded with warming spices and topped with the most amazing cream cheese frosting. 100% whole grain and vegan! If I come back in another life as a baked good I WILL BE THIS BREAD OF ALL BREADS. Sweet, sassy, fun, unique…you picking up what I’m throwing down? I’m twinning with this dream loaf! I legitimately think that a) this is my favorite blog recipe ever and b) these are my favorite photos ever. And even though this may look like just another recipe to you, it feels really, really symbolic to me. Like the universe blessed me with this high vibin’ frequency to produce something so epically luscious and drop dead gorgeous for your face. I MEAN CAN YOU EVEN WITH THIS? You bet your hiney that I took my Vegan Chocolate Chunk Banana Bread recipe and modified it to make this chai-spiced carrot banana bread version packed with pecans and fun chai spices and cream cheese frosting (I used my homemade Vegan Cashew Cream Cheese) because…life is too short to not put cardamom in your carrot cake. Lettuce rewind and chat about why this bread was meant to be. The last couple months have been kiiiiinda tough. I’ve been working pretty much every day, bopping from Hummusapien duties to Alchemy obligations and basically doing some kind of work (social media, menu planning, restaurant stuff, cooking, writing, photographing, emails) during most waking hours. Owning a business(es) is hard in every sense of the word. There’s no sugar-coating it. And like any business, the blog and Alchemy don’t sleep. Lately my days look something like this: wake up around 7am. Work on blog stuff until 830am. 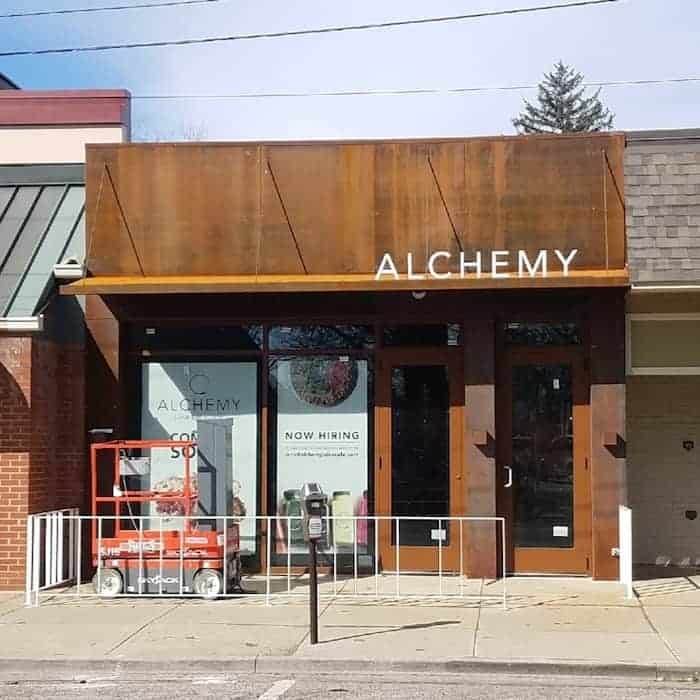 Get ready, eat, and go to Alchemy or a meeting around 9am. Do restaurant stuff all day. Maybe work out around 6:30pm, maybe not. Make dinner or reheat leftovers (god-willingly) around 8pm. Shower and probably not wash my hair. Grab my computer and work on the blog and/or Alchemy until 10 or 10:30pm. Sleep. Repeat. And then last week I got that chest tightness I get a couple times a year, like my body is ahead of my brain and it wants to have a panic attack but my mind’s not on board. I didn’t feel super stressed mentally, but my body sure did. I’ve worked harder these past few months than I have in my entire life. Has it been difficult? Without a doubt. Have I made sacrifices? Sure. But there’s so much amazingness weaved into the day to day grind. It’s those lovely moments that make it worth it a hundred times over. I know it won’t be this past-faced forever. At least I have the best ever carrot banana bread to fuel with, right? And a new assistant! Mad love to Jeremy. 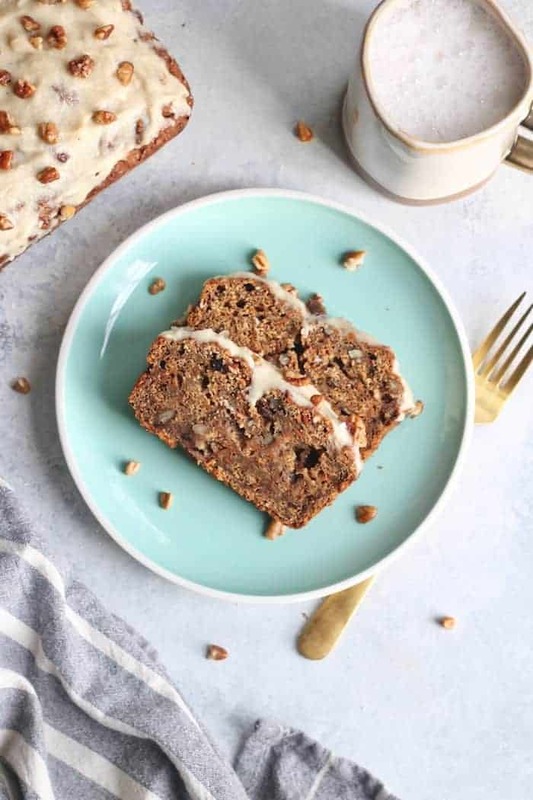 I want you to know the joy I felt when I took a bite of this chai-spiced carrot banana bread, when I drooled over the photographs, when I actually felt enamored writing these words to you at 10:29pm on a Sunday. The excitement for the future that both businesses hold is what wakes me up every morning. I’m so proud to have built a business out of this blog that’s so insanely closely tied to my heart. SO! The reason this recipe is meant to be is because despite working wild hours and wondering if I’m going insane, I felt better today staring at this carrot cake than I’ve felt in a long time. It was that feeling that keeps me inspired. Simple but so strong. It all felt full circle—the past, the present, and the future. I know what I was put on this earth to do and I’m doing it. Preheat oven to 350F. Grease a 5x9inch loaf pan. In a small bowl, stir together flax and water. Set aside to thicken. Melt coconut oil in a small bowl and set aside to cool. Grate carrots and set aside. In a large bowl, whisk together flour, baking soda, spices, and salt. In a medium bowl, stir together mashed banana, grated carrot, sugar, coconut oil, milk, vanilla extract, and flax mixture. Pour wet ingredients into dry ingredients and stir until just combined, being careful not to over-mix. Gently fold in pecans. Pour into prepared baking dish and bake for 1 hour and 10 minutes, covering with foil after 50 minutes. Meanwhile, make frosting by beating together cream cheese, powdered sugar, and vanilla (I used a hand mixer) in a medium bowl until smooth. Remove bread from oven and cool in pan for 15 minutes. Remove from pan and let cool completely on wire rack. When bread has cooled, spread with frosting and top with a sprinkling of pecans. Slice and serve! *For a gluten-free version, readers have had success with substituting 2 cups 1:1 GF baking flour OR 1 1/2 cups GF baking flour + 1/2 cup almond meal. Thank you so much for sharing what it takes to run your businesses! I’m in awe of your work ethic. I’m also in awe of this bread. Matt & I are do excited to enjoy this on Easter! Someone (Kylie/immaeatthat, I think) posted a chai bread recipe last week sometime and I was thinking of trying that, but this looks good on a whole nother level! The spice of chai plus the solidity of carbs just sounds like such a good comfort food to me. You’re a force to be reckon with , and you inspire me to be one too!! Thanks for sharing your authentic story and so OBSESSED with this recipe! Cannot wait to make it! I think I’ll make it in honor of RD day! Thanks for the recipes as always ! I am such a fan. Quick question- have you posted the recipe for the cashew cream cheese, and if so where can I find it? Hey! I’ll do a full post about the cashew cream recipe soon but in the mean time, I laid out the recipe method in this post: https://www.hummusapien.com/what-i-ate-this-week-15/ Enjoy! All your bread recipes lately have me SWOONING. I want to try this bread RIGHT NOW but do you have a gluten-free substitute for the flour or is it important for the texture? I always have great success with Bob’s Red Mill 1-for-1 all purpose GF flour! My husband has Celiac, and we both enjoy baked goods made with this blend. Bobs GF 1 for 1 is amazing! Girlllllll , I’m loving all these baked goods you’ve been posting!! Can’t wait to try this one. What’s your cream cheese recipe?? Thanks! I lay out the recipe for the cream cheese in this post: https://www.hummusapien.com/what-i-ate-this-week-15/ and I’ll be doing a full blog post on the cream cheese soon!! YUM! I was so excited to see this recipe. Thank you for sharing, can’t wait to make it! My mouth is literally watering reading this recipe and looking at the pictures. I can’t wait to try it! Thank you for all of your hard work that is trickling down to make me a better person. You continue to be so inspirational. You’re the sweetest. You made my night, Lisa! Yum! I love cream cheese frosting so this looks awesome. Congrats on the second store opening! That’s so exciting! Had all the ingredients and whipped this up last night! Love the spice flavor and great texture. owning businesses or juggling jobs is not easy and i have a huge respect for you, always being open about your journey! and…yes to all things cardamom. This look absolutely amazing. Putting on my need-to-make list! Could you substiture eggs instead of flax? If so, how may would you suggest? 1) Your work ethic is SO inspiring, it pushes me to keep working at my corporate job until I can finally do what I love- restaurants/food! 3) I’m so glad I’m not the only one that gets “that feeling” from an awesome food picture/recipe/etc. Love it, thanks and can’t wait to try!! What would the amount be if using AP flour? this was quite yummy, I would say it’s more of a breakfast kind of cake with tea, it almost tastes like a fruit cake..
i’m surprised at your cooking time?? It only took 35 min for mine to bake and I could have taken out 5 min earlier… what setting do you bake on? (fan or top/bottom grills…)? Hmmm I baked mine in the middle of the oven. I used very mushy bananas. You could always add more sweetener if you prefer a sweeter cake but I thought it was perfect with the frosting! This was excellent. I think next time I am going to add extra carrots because it reminds me of my favorite carrot cake. I did add walnuts and dried blueberries to the batter and I forget the icing. I am not an icing person. Everyone that had it LOVED it! Since my spouse who is now eating better, thought it was plenty sweet and ate half of it? Made this this week and it’s one of my new favorite quick breads. The frosting amount was just enough to sweeten it up without being too much. Plus my kids loved frosting the bread for me. I think the spices were a little too much for my kiddos but that’s fine because I have the whole loaf to myself now. ? I also found that baking for 70 mins was a bit too long. 60 was perfect. holy moly, this looks amazing. thanks for hustling and sharing the fruits of your labor with us! i’m going to plan to make this bread this weekend! for the meal!! But yeah, thanx for spending time to talk about this subject here on your web page. Hey, Alexis! I absolutely love this recipe–it’s so creative! 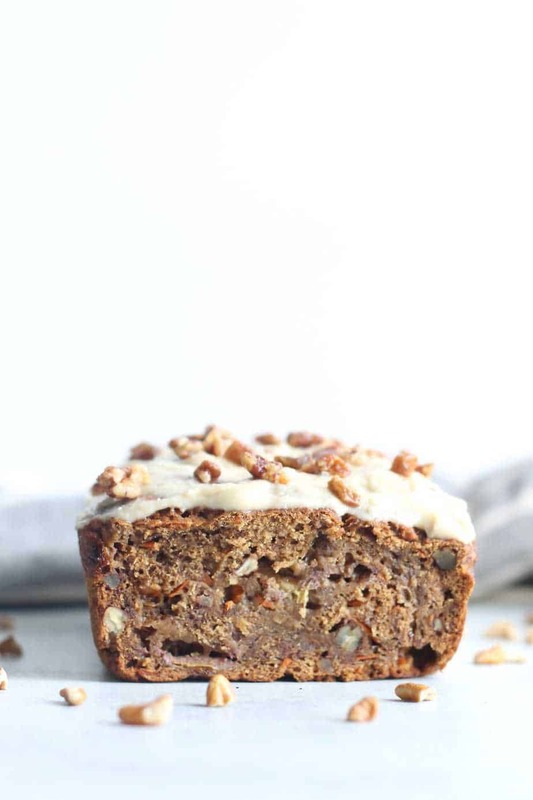 I’m usually a pb&chocolate banana bread gal, but this chai banana bread ruled! 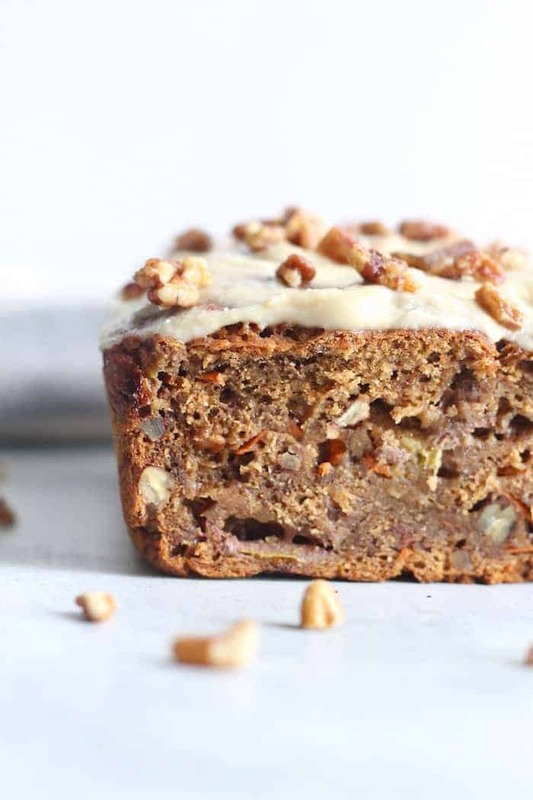 Awesome hybrid of carrot cake and banana bread. I add 1/2 a teaspoon of ginger and cinammon to the cream cheese frosting–SOO freakin’ good! I have celiac, so I used 1 cup of oat flour and one cup of gluten free pancake mix, which worked PERFECTLY (oat flour can gte heavy as I’m sure you know). Love you girl!! Helmet Heroes http://helmetheroes.games is a an enormously multiplayer duty playing video game in which you can coordinate with your online good friends and check out regions and battle against enemies. It includes virtually 40 enemies, thousands of various weapons, safety helmets, shield, and also accessories. You could pick between being a warrior, archer, wizard, or cowboy. Or if you ‘d like, you can combine classes as well as create you own mix. You could likewise double possess tools and also use shields. There are a large number of unique skills to choose from as well as the capability to let loose massive earth drinking power levels to excite other gamers and also aid you knock via waves of enemies. In your downtime from combating, you could fish for over 40 various fish, or you can chop down trees to get timber to craft new tools. You can likewise buy animals which will certainly help you fight opponents and also you could also ride them! I made this delicious bread last night. It was everything I’d hoped it would be. ? It has the taste of an exotic banana bread, so warm and aromatic. Moist, tasty and delightful. Bravo! Thank you so much! If you could leave a star rating I’d be so grateful! You are definitely a busy lady! Next time I make this, I am switching the flax with eggs, trying a bit more coconut oil, adding more ginger and allspice and salt. I added both cane sugar and some maple syrup, but felt this was a bit bland. I agree with the readers who recommended a shorter baking time. Good concept, but needs a little tweaking for my taste. That is the beauty of a recipe like this. Hi there! The loaf is super moist per the recipe—are you spooning and leveling the flour versus packing it in? Oven temps do vary as well. Enjoy! Looks so yummy!! I’ll try it home. This is amazing. I just made it yesterday and it’s so moist and perfect. I added raisins and also did 1.5 cups of carrot instead of just 1 cup — it was an accident, but turns out it worked well! Hi, very excited to try making this tonight! Just wondering, how would you suggest changing the baking time if I make this in an 8×8 pan? Or would you suggest not doing that?